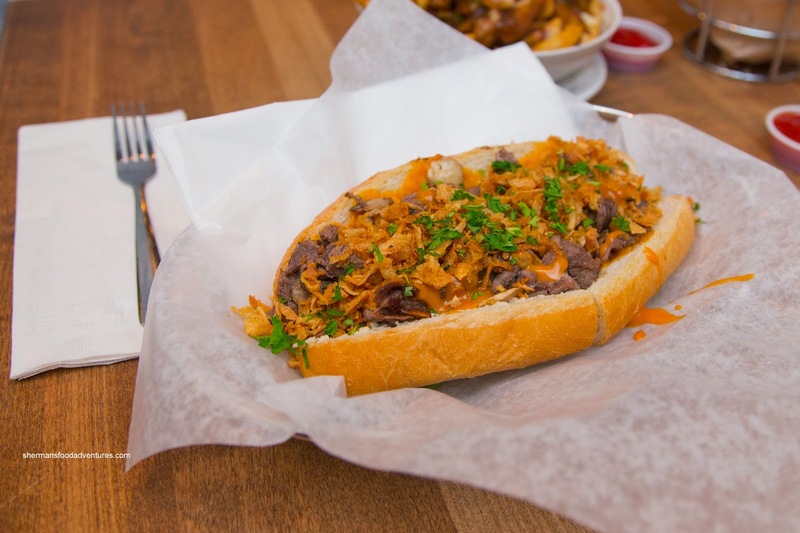 Sherman's Food Adventures: American Cheesesteak Co.
With our impending trip to the East Coast next year, there are several things on my bucket list, in particular, good eats. One of them is the Philly Cheesesteak. I guess the hype is further amped by my friend who is from Philly - she has given me the lowdown where to find an authentic cheesesteak that is not made purely for tourists. But until that time, my cheesesteak adventures are limited to what we can find in the GVRD. 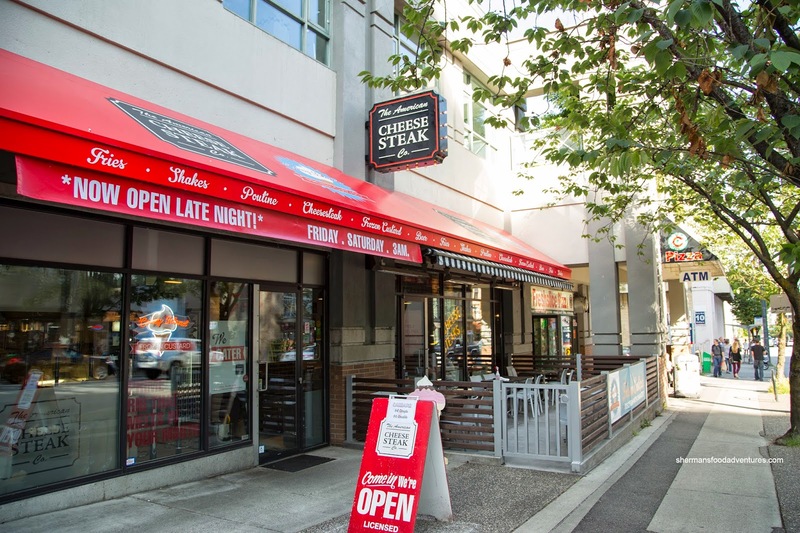 Awhile back, Costanza and I had checked out the American Cheesesteak Co, but with only 2 items to talk about, I never wrote a post. However, after a late hockey game, I enlisted the help of Lionel Hutz and Milhouse for a re-visit one early morning. Normally, the thought of 2 identical orders of food would send me spiraling into despair much like a Canuck "bandwagon" jumper when the team goes on a losing streak. To make it worse, that's what I had last time! But no worries, this was a re-visit! Serenity now... They both got the Cowboy Cheesesteak consisting of shaved prime rib, crispy fried onions, homemade spicy BBQ sauce, bacon mayo and aged white cheddar. Like last time, there was no absence of tender beef that was not dry, especially with all of the other ingredients involved. Naturally, with the addition of BBQ sauce, the whole thing was saucy, sweet and only a touch spicy. On the side, they had the Onion Rings which were fried really crispy while not particularly greasy. Due to the thinness of each ring, there was not a whole lot of onion texture left. On a previous visit, I sampled Le Biftek consisting of shaved prime rib, sauteed onions, double-cream brie, arugula, dijon mayo and balsamic reduction. I found this one to be pretty rich due to the creamy brie. But the balsamic did add a sweet acidity to balance it off. This time around, I decided on the Classic with shaved prime rib, mushrooms, crispy onions (in lieu of sauteed onions) and cheese whiz. 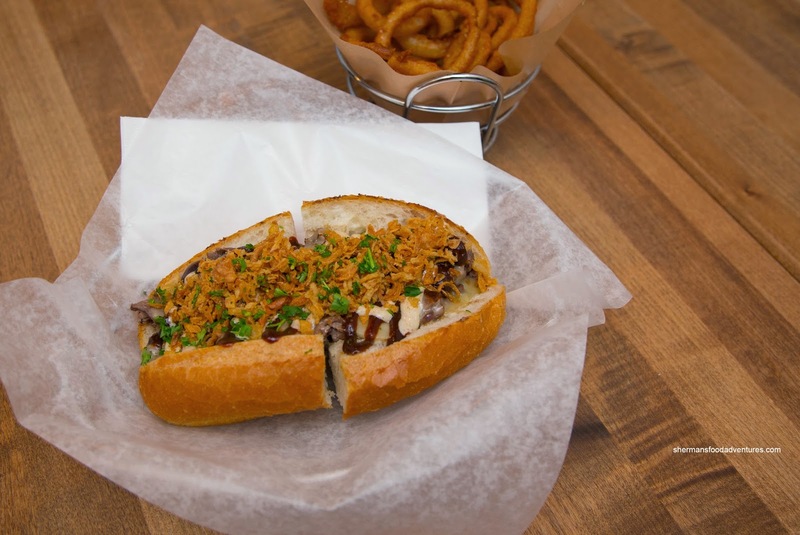 For those unfamiliar, cheese whiz is the cheese of choice for an authentic cheesesteak. Being more basic, without a bunch of sauces, this ate a bit drier. Yet, with a good amount of cheese whiz, it was still saucy enough. 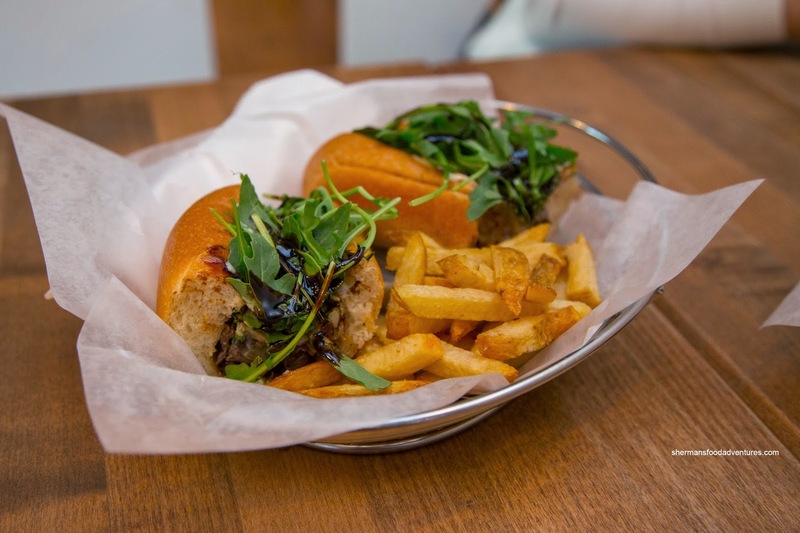 We liked the bun as it as soft, while being able to stand up to the ingredients. 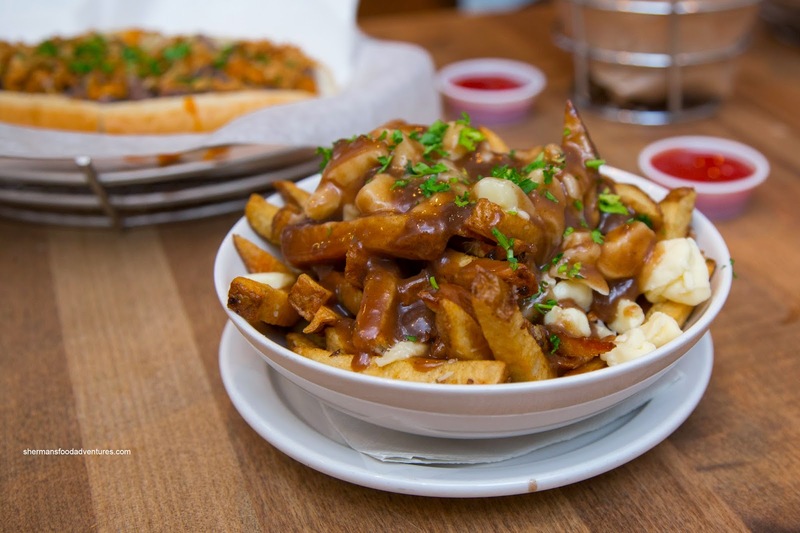 For my side, I went for the Poutine with house-made mushroom gravy and cheese curds. Made with the same crispy fries as last time, they held up well to the gravy. As for the gravy, it had a noticeable onion finish whereas the salt content was pretty high. I liked the ample amount of cheese curds, but most of them had melted. By virtue of never having visted Philly (not yet at least), I can only compare with what I've had in the past. In that case, I thought the stuff at American Cheesesteak Co to be more than acceptable, especially for late night eats. While the ideal cheese for a cheesesteak is a hotly debated topic amongst the purists, my preference is for the milder provolone, which allows the other flavours of the sandwich to stand out instead of being overshadowed by some of the other more robust cheeses. One of my favourite combinations is adding eggs over easy to the Philly basic (you can add the eggs to any sandwich). The eggs can sometimes be hit or miss, depending on the cooks ability, but when they get them cooked right, it's a beautiful thing. They have a generic hot sauce available, or, if you ask, they also have some Tabasco sauce available to splash on your eggs, Breakfast of champions! - available any time. I'm surprised you didn't leave room for their frozen custard which you can't find anywhere else in the GVRD. @ LotusRapper - Sadly, Hot Doug's closed the business for good last October.